George Dickel. The “other” Tennessee whisky. That’s how these articles always start out. Isn’t it? If it wasn’t for the fact that they are owned by Diageo, the world’s largest drinks company, you’d almost feel bad for them. Dickel can’t even get a mention without someone bringing up, normally the writer, the bland behemouth. 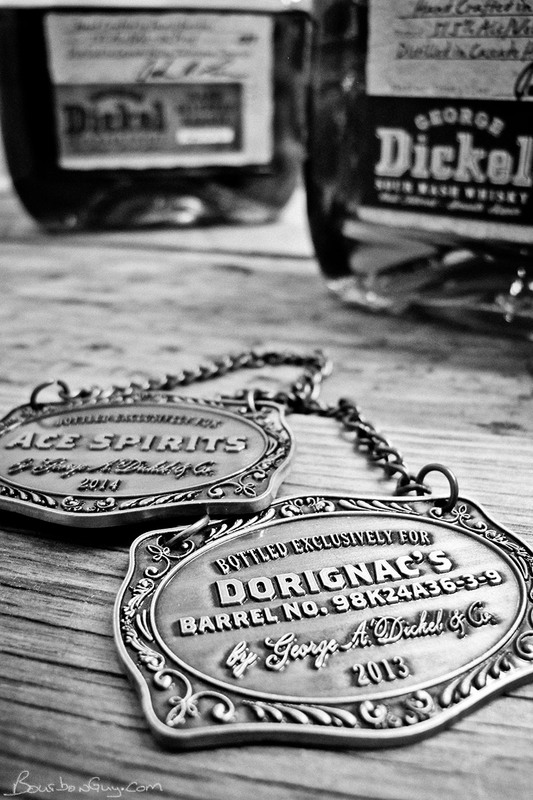 Somewhere around the middle of 2013, bottles of George Dickel “Hand Selected Barrel” began appearing in stores. It was initially available in both 14 and 9 year versions though the scuttlebutt is that there were very limited 14 year barrels available and, as can be expected, they sold out quite quickly. Really? I’d read that the 14 was limited and sold out and a grocery store in New Orleans had it? I was visiting Ace Spirits here in the Twin Cities looking for some bitters that I was doing a blog post on when one of the guys working there offered me a taste of the 9 year Dickel private selection they had just done. Not being one to turn down a free sample, I gladly took the Glencairn that was offered and gave it a good nosing and a sip. Yep. I was buying that one. Once I had both of these in the overflow closet, the only thing to do was to compare them. Mouth: Hot. Oak caramel and hint of vinegar. With water: still a lot of oak, but the heat is calmed and it becomes a bit sweeter. Finish: Long and warm with lingering sweet caramel. Water didn’t affect the finish much. Thoughts: This guy wants water. Don’t get me wrong, I bought it after tasting it neat in the store but water calms it a bit and allows more sweetness to appear. It’s quite good. I like this. Finish: Nice and long. Good warmth. Lingering caramel and fruitiness. Thoughts: I like this one alot. It is scary easy to drink at 106 proof. To be honest if handed this blind, I would have guessed it was a Four Roses, but given how much I like them, that’s a good thing. These are both quite good. For me, the 14 year wins hands down due to being less oaky, sweeter, fruitier and easier to drink. My wife on the other hand prefers whisky with more oak on it so she prefers the 9 year. Both are highly recomended.